Turns out there's more than one way to make a foldable phone. While we wait the official unveiling of Samsung's long-anticipated Galaxy X (or Galaxy F) handset, a new patent reveals the company's alternative plans for creating a bigger, tablet-style display – attaching two handsets together via a magnetic lock. Spotted by LetsGoDigital, the newly published patent shows two handsets fixed together at the edges to create a bigger screen. As the phones and magnets rotate around the axis, you've effectively got a jumbo foldable phone. 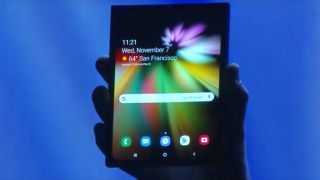 This won't be replacing the truly foldable handset that Samsung has already been showing off in prototype form, but it may be a sign of new features on their way to future flagships from the manufacturer – the Galaxy Note 10 perhaps? It's possible that this is one of the ways the Note series will continue to be separate from the Galaxy S series. The design shown off in the patent is along similar lines to the ZTE Axon M we saw last year: a foldable phone made from two displays with a hinge in the middle, rather than a truly flexible display. In this case though, both halves could still be used separately. This clever use of magnets opens up a variety of options for snapping phones together: as well as making one large screen, you could have one phone facing forwards and one facing backwards for the perfect selfie taker. Alternatively you could have the two phones on top of each other, both facing the same way, to create a full-screen display with a slide-out keyboard on the second phone. As always with patents, treat this as a hint of what Samsung's thinking about – this won't necessarily make it to market. If it does, remember you'll have to pay double for your second phone, so you might want to start saving now.